Frostbite can be life-threatening and understanding how to prevent and treat it would save your life when dealing with exposure. This primer will teach you all you need to know on shunting, the stages of frostbite and the treatments available. 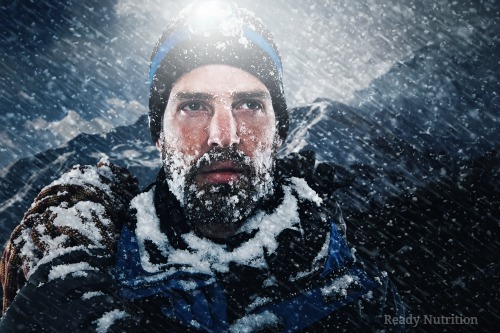 ReadyNutrition guys and gals, this article will focus upon our Winter First Aid measures to treat Frostbite. We will cover first aid procedures, as well as, the ways to understand and recognize frostbite for what it is. As this is a medical condition, keep in mind we are giving first aid parameters to deal with in a wilderness/field environment. After you render first aid, immediately transport the patient to a doctor or a definitive healthcare treatment facility. Frostbite is tissue damage sustained by prolonged or extreme exposure to cold temperatures. The tissue in this case refers to the epidermis, or skin layers. When the skin is exposed to temperatures of 32 degrees Fahrenheit or below, the vessels next to the skin surface begin to shrink and constrict. This causes shunting, a condition where the blood is whisked away from limbs and other parts of the body away from the thoracic cavity, or chest. Shunting is a necessary survival response to the cold. You may have seen episodes of shunting when, for example, someone’s car plunges into an icy river or body of water. The person may be lying unconscious in the water for almost an hour, yet they live. This is called the mammalian dive reflex, and is a type of shunting. The body (to preserve itself and survive) removes the blood from the extremities and sends it to the core (heart, lungs, and thorax). First Degree Frostbite – only affects the outermost layer of the skin. It is characterized by mild pain with itching and some redness upon return of blood flow to the area. Another name for it is frostnip. First-degree frostbite does not usually result in any long-term damage, although the experience can lead to a long-term susceptibility to cold weather injuries and extra sensitivity for the afflicted body part/area. Second Degree Frostbite – this is a more severe form that is subsequent to first-degree frostbite. In this form, the skin may actually be frozen and assume a rigidity akin to actual ice. After several days (1-3 in most cases) blistering can happen to the areas of the skin that were frozen. These may turn black and rigid; however, it usually heals up completely in about a month or so. Once again, these affected areas may hold a permanent sensitivity to cold and susceptibility to cold weather injuries. 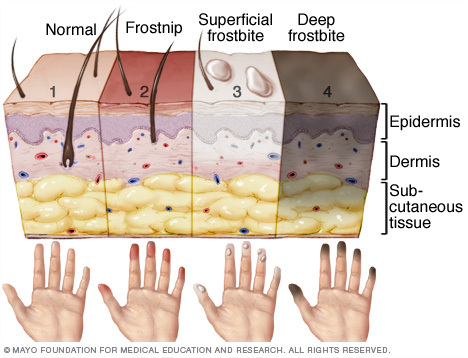 Third Degree Frostbite – This is characterized by the depth of the skin frozen, as well as structures below the skin. Such structures include muscle, veins, arteries, nerve tissue, tendons, and cartilage. This type of frostbite is most severe and may result in the loss of limbs and structures such as hands/feet and the digits. The greatest cause/contributing factor (in addition to the cold, naturally) is poor or compromised blood circulation to the affected area(s). The shunting that we mentioned earlier is a big contributor, as well. With third degree frostbite, there are blisters that become purple and then turn black. The blisters are filled with blood, and the affected areas may need to be amputated. Those who have health factors such as diabetes and are taking certain medications such as beta-blockers place people at high risk for this affliction. 1) Passive Rewarming – this is accomplished by either using room temperature of a warm structure, or by body heat (the patient’s own, or another person providing first aid). Addition of warm clothing and use of blankets are also part of this method. 2) Active Rewarming – this is where heat is directly applied to a person. Such is accomplished after the steps to passive rewarming have been undertaken. Immersion of the affected tissues in a water bath between 104-108 degrees Fahrenheit is the preferred method. Such is undertaken because the more quickly the affected tissue is rewarmed, the less potential there is for a permanent cold weather injury and damages that are affected in the long-term. As the first-line first aid provider, follow this rule: DO NOT MASSAGE OR RUB THE AFFECTED AREA! Ice crystals can form in the tissue that has been frozen, and any kind of movement such as rubbing or other physical actions can cause the ice crystals to further damage the tissues. Keep your patient warm. Keep them dry and covered, and make sure their clothing is not too tight or restrictive so as to prevent circulation. As we have covered in other articles, continuously monitor and reassess the patient! JJ’s rule: When treating any condition, always monitor and reassess for shock. Remember: a patient can “crash” when they have been affected by severe trauma such as a severe case of frostbite. They have been weakened by exposure and the trauma. “Crashing” is when their vital signs (temperature, pulse, blood pressure, etc.) take a “nose dive” and the patient slips into shock. Shock kills! It is an insidious enemy that can always creep up on you to ally itself with the injury. Please remember this always. Know your limits: know the area you are camping or hiking in and the weather patterns. Know yourself and what you can and cannot do physically. Emergency hand and foot warmers: Those commercial “hot hands” packets, and such. For those of you who are wondering, you must read the short story, “To Build a Fire” by Jack London…you’ll never want to be without hand warmers again! If your hands are cold/frozen, you will need to thaw them out to build a fire. Take plenty of food and water: It is very important to hydrate yourself, as you will waste a tremendous amount of water through physical exertion and your body’s response to cold. Bring high-calorie, easily digested foods that give you quick energy, such as trail mixes and chocolate bars, along with dried fruits and hard candies. Have a place to warm up in an emergency: Even if it is just a vehicle, make sure you can go into a structure that will allow you to rewarm frozen tissues and affected body parts. Protect your skin from further exposure. Gradually warm frostbitten areas with warm water (never hot). Do not rub or massage frostbitten areas. Don’t walk on frostbitten toes or feet, if possible. If there is a chance the area will freeze again, don’t thaw them. Remember with all of this that you must seek medical attention immediately. Take them to a doctor or a hospital as quickly as possible. Frostbite is treatable and it is best defeated by proper prevention and planning prior to your outdoor excursions. Enjoy yourself the most by preparing yourself beforehand. Have a great day! I agree with most everything JJ has to say. A few cautions though: don’t put on that extra pair of socks if they make your boots too tight. I once frosted a toe in ski boots because my feet are very wide and the extra sock impaired my circulation. The second thing is to not thaw frozen extremities if you can’t keep them thawed. Refreezing can cause more damage than the initial freeze. Obviously if you are in this kind of prediciment you are in real trouble. If you are going on multiday ski, snowmachine or mountaineering trips take every precaution to avoid hypothermia and frostbite. In a real SHTF situation you probably cant call for rescue on your satalite phone and be wisked away to warmth by a rescue helicopter. Stop and build a fire and rewarm before you go over the edge. Avoid alcohol and other mind altering substances on the trail. You need your head fully functioning when out in extreme cold. If you are new to extreme cold try and start out slowly until you know how your body will respond and you can get to warm shelter before you are in trouble. Have fun. Be safe.